Credit ratings agency Moody's has downgraded 15 global banks and financial institutions. The UK banks downgraded were Royal Bank of Scotland, Barclays and HSBC. Lloyds also had its rating cut by Moody's in a separate announcement. BBC business editor Robert Peston said banks were concerned the downgrades may make it harder for them to borrow money, but their shares rose on Friday. John Raymond, senior banking analyst at research firm Credit Sights, said Moody's announcement would have little impact on the banks' ability to borrow funds - and in turn on their customers - because it was so expected. "The downgrades from Moody's have been expected for some time, and therefore had already been factored in," he told the BBC. "So I don't think Moody's move will mean the banks end up having to increase the interest rates or charges that their customers face." Explaining the decision for the downgrade, Moody's global banking managing director Greg Bauer highlighted the banks' exposure to volatility in the world's financial markets. He said that all of the banks affected by the downgrades had "significant exposure to the volatility and risk of outsized losses". Moody's added that it was putting some of the banks on a negative outlook, which is a warning that they could be downgraded again in the future. Explaining this, it said governments around the world had shown a "clear intent" to reduce their support for banks going forward. 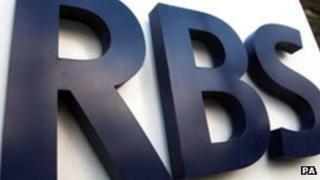 In Friday trading, shares in Royal Bank of Scotland were up 1.5%, HSBC had gained 0.7% and Barclays had risen 0.9%. Lloyds was 1.6% higher. In France, Societe Generale was up 2.5%, while in Germany, shares in Deutsche Bank had gained 0.6%. On Wall Street, Bank of America was up 0.9% and Citigroup rose 1.2%. Moody's gives banks a long-term credit rating, ranging from a high of "Aaa", down to a low of "C"
Jonathan Newman, banking analyst at investment firm Brewin Dolphin, also said Moody's move should have little impact on the affected banks because it was so widely expected ever since the rating agency first announced the start of its review in February. "Moody's has sought to avoid creating a shock event and has kept the market well-informed as the process has gone along," he said. Yet Peter Hahn, a former executive at Citigroup and now a lecturer at Cass Business School in London, said the downgrades could limit the banks' activities. "Banks are going to have to put up collateral in their transactions with other banks," he said. "As they get downgraded, other banks and system players don't want exposure. "It's a constraint on capital, it's a constraint on business, so it's obviously not welcome for us, trying to get more money into the economy." In a statement, RBS responded to its downgrade saying: "The group disagrees with Moody's ratings change, which the group feels is backward-looking and does not give adequate credit for the substantial improvements the group has made to its balance sheet, funding and risk profile." Lloyds said it believed that the change would have "limited impact on our funding costs and market capacity". In the US, Citigroup said it "strongly disagrees" with Moody's decision. Of the banks downgraded, four were cut by one notch on Moody's ranking scale, including HSBC, Royal Bank of Scotland, and also Lloyds. "The biggest surprise is the three-notch downgrade of Credit Suisse, which no one was looking for," said Mark Grant, managing director of Southwest Securities. Moody's separates the 15 banks into three groupings, relative to its assessment of their resilience to any global financial market turmoil. It puts HSBC in its strongest "first group", together with Royal Bank of Canada and JP Morgan. Moody's says these banks have "stronger buffers" than many of their peers, and "generally more stable businesses". Barclays is in its "second group" of banks which Moody's says face "sometimes adverse factors". Other banks at this level are BNP Paribas and Goldman Sachs. RBS is in the bottom "third group", which comprises banks which "have been affected by problems in risk management, or have a history of high volatility". Other banks in this grouping include Bank of America and Citigroup.